IT HAD A glitzy launch in Dublin’s Mansion House, was accompanied by a primetime TV documentary and was written by one of the country’s most high-profile broadcasters. Ryan Tubridy’s JFK in Ireland: Four Days That Changed a President was not exactly a dark horse for the Irish Newcomer of the Year category which it won last night at the Irish Book Awards. The Hughes & Hughes Irish Novel of the Year: Room by Emma Donoghue. RTE Radio 1′s The John Murray Show Listeners’ Choice Award: Come What May by Donal Og Cusack. The Ireland AM Irish Crime Fiction Book of the Year: Dark Times in the City by Gene Kerrigan. The Argosy Irish Non-Fiction Book of the Year: A Coward If I Return, A Hero If I Fall by Neil Richardson. Eason Irish Popular Fiction Book of the Year: The Oh My God Delusion by Ross O’Carroll Kelly. Irish Newcomer of the Year: JFK in Ireland: Four Days That Changed A President by Ryan Tubridy. International Education Services Best Irish Published Book of the Year: Good Mood Food by Donal Skehan. The Dublin Airport Authority Irish Children’s Book of the Year: On the Road with Mavis and Marge by Niamh Sharkey (junior winner); Skulduggery Pleasant: Mortal Coil by Derek Landy (senior winner). 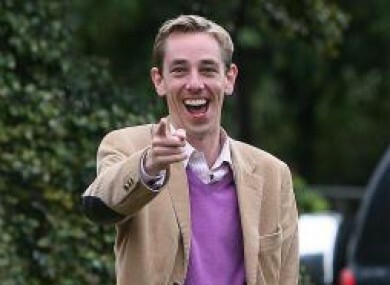 Email “Tubridy takes best newcomer prize at Irish Book Awards”. Feedback on “Tubridy takes best newcomer prize at Irish Book Awards”.